Could TRAPPIST-1 Be Home to a Galactic Alien Empire? Imagine a galactic empire spanning across multiple planets that are just a few days’ travel apart from one-another. With the discovery of a star system of seven potentially habitable planets orbiting the ultracool dwarf star TRAPPIST-1, the sci-fi fantasy possibilities are endless. In light of this intriguing announcement, Seth Shostak, senior astronomer at the SETI Institute, considers what the TRAPPIST-1 system might look like if it were home to a race of intelligent aliens. 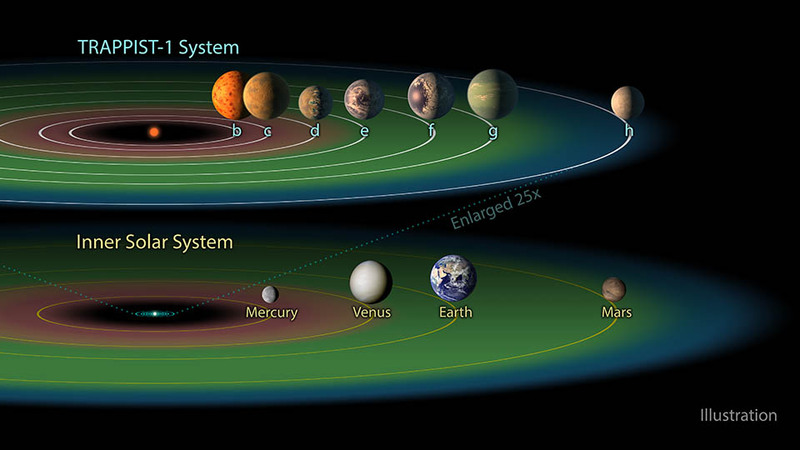 These planets are all approximately the size of the Earth and all orbit close enough to the star that the surface temperatures on those planets may be tolerable for liquid water — an essential element for life to evolve. “Remarkably, these planets are of a type that would make them candidates for hosting the dirty chemistry we call ‘life,’” Shostak wrote in a blog post. That being said, there’s no way of us knowing for sure if there’s extraterrestrial life on the TRAPPIST-1 planets — at not least not yet. Scientists don’t know what the atmosphere or geology of these planets are like. There’s no telling if there’s life residing on the surface — and obviously even less information how evolved such life might be. It will be quite some time before that kind of data starts to roll in. In the meantime, Shostak says we should look for radio signals that can tell us if there’s possibly intelligent life on these planets. Last year, the SETI Institute used its Allen Telescope Array to observe radio signals on TRAPPIST-1, but did not detect any transmissions. However, there are still new observations coming up, and there’s hope they may show something more promising. If there is indeed intelligent life in the TRAPPIST-1 system, they may have a multi-planet federation. Unlike our solar system, these planets are all close neighbors. Aliens could potentially stretch their empire across the star system because the planets are that nearby. Meanwhile, on Earth, humans are still yet to land on any other planets. Aliens on the TRAPPIST-1 planets would probably celebrate a lot of birthdays. The planets have such tight orbits that a year on any of those planets is less than three weeks. The innermost planet, TRAPPIST-1b, has a 36-hour year. Talk about endless birthday parties. “It’s more compact than a bonsai bush, and if we could arrange to move all seven of these worlds to our own solar system, they would fit within the orbit of Mercury with oodles of room to spare,” Shostak wrote. This graphic compares the orbits of planets in the TRAPPIST-1 system and the solar system. What’s more, TRAPPIST-1 aliens would have a magnificent view of the sky. In our night sky, we only see the moon and twinkling, distant stars and planets. But on a TRAPPIST-1 planet, you can easily see planets that are not tiny dots in the sky, but round balls gliding across the night. The planets would also move faster, so within minutes, the planets will change positions. It’s unlikely that life evolved on all seven of these planets, but if life emerged on just one planet, asteroids could quickly disperse the elements of life to other planets. 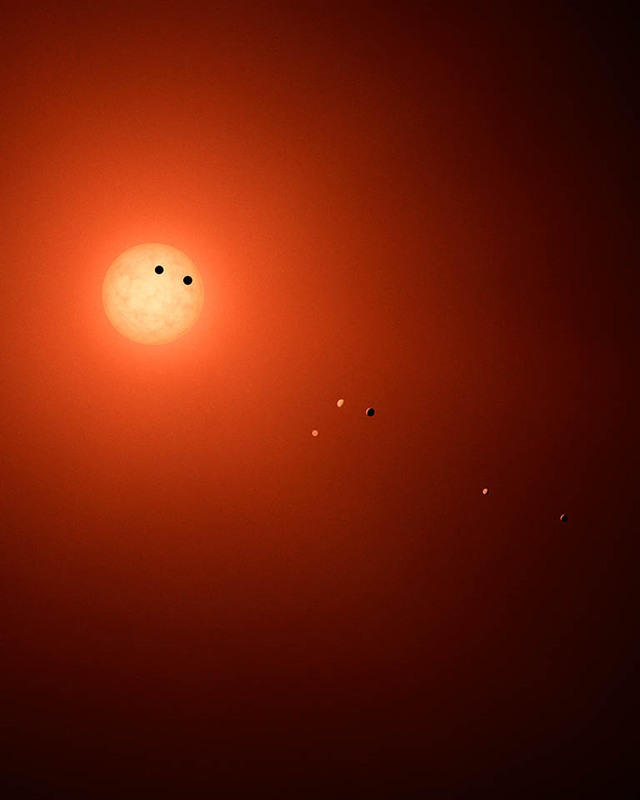 Whether the TRAPPIST-1 system ultimately has life or not, this discovery is another sign that there are most likely many other worlds out there where life can emerge. “If you still think the rest of the universe is sterile, you are surely singular, and probably wrong,” Shostak wrote.